“Surface right owners are a mere nuisance and are expendable.” . The oil and gas boom has been underway for a number of years in many locations across the country, and there are now a lot of stories about individuals and families whose lives have been personally affected. I’m going to start a regular series of those stories on this blog to help you envision what could happen if drilling expands along the Beartooth Front. For now, look for these about once a week. Today’s story comes from the booklet Shalefield Stories: Personal and Collected Testimonies, published last month by Steel Valley Printers of Pennsylvania. 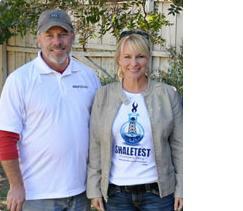 Aruba Petroleum began drilling on a property adjacent to Tim and Christine Ruggiero’s home in Wise County, Texas in August 2009. On September 16, Aruba began drilling two wells on the Ruggiero property. Since that time, they have experienced several spills, a possible methane seep where bubbles ignite, constant emissions from various stages of the extraction process and noise pollution. They have had several Texas Commission Environmental Quality (TCEQ) air studies as well as private testings that show toxins exceed standards, including benzene at 120 ppb. drilling the company cut down their fence where the horses were grazing. They were not told ahead of time that the company planned to drill there. Although Aruba put up a sound barrier, it is not long enough to cover the length of the house, so it does not help with the noise. They have a clear view of the rig and wastewater pit. were not taken until five days after the spill occurred, and Aruba had watered the area down for five days. Christine was told that Aruba would conduct the tests and report the findings to the TRC. The TRC found problems with the pit that needed to be corrected. The TRC admitted that the areas should be tested for carcinogens, benzenes and hydrocarbons. 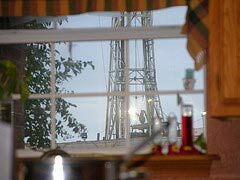 This entry was posted in Personal stories and tagged Fracking, personal stories, property values, Ruggiano, surface rights, Wise County Texas. Bookmark the permalink.